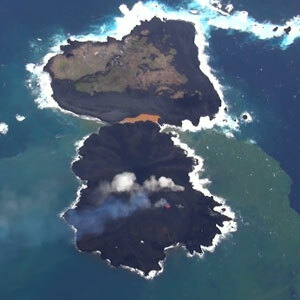 A volcanic eruption in the Pacific Ocean has caused a new island to emerge from the sea. The island, which is 620 miles south of Tokyo and comes under Japanese territory, has merged with neighboring uninhabited Nishinoshima as it contines to grow. Aerial photographs show that the flowing lava is causing the island to continually grow and change shape. At one point, as the BBC reported, the island bore a remarkable likeness in shape to the cartoon dog Snoopy. But the island’s shape isn’t guaranteed to last as experts say that the volcano remains highly active with continually rising red magma causing the island to develop. Japan’s coastguard has warned tourists that the area is extremely dangerous and should be avoided.